You'll love how easy these are to make! It starts with a pound of raw cashews (about 3 cups). I had some concerns about using raw cashews rather than toasted because, as I'm sure you know, the difference in flavor between toasted and un-toasted nuts is huge (particularly when it comes to cashews)! But I figured the nuts will have plenty of time to toast as they bake with their topping (that said, I did end up baking the nuts longer and hiking up the oven temp near the end of baking to make sure they reached maximum flavor). Whip 1 egg white until nice and frothy, then add in a mix of granulated and brown sugar, salt, and about 1/2 teaspoon of cinnamon. I like to go a little light on the cinnamon so I used about 1/4 teaspoon. Once mixed together, spread the nuts in a single layer over a baking sheet lined with parchment paper (don't forget the parchment paper for far easier cleanup). They're supposed to bake in a 300 degree oven for about 30 minutes, giving them a toss once or twice during baking. I didn't think the nuts were browned or fragrant enough towards the end of baking so I hiked up the oven temp to 350 degrees at around the 25 minute mark and baked the nuts for an additional 10 minutes or so. Keep a steady eye on them at this point and watch for the nuts to be golden brown and toasted. 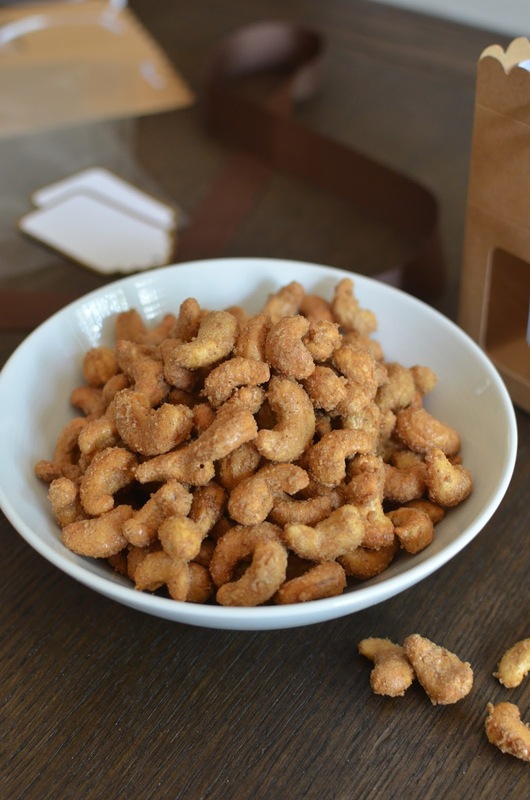 You should smell that fragrant, sweet aroma from comes from toasted cashews. Let the nuts cool completely, before breaking them apart further, if necessary, and storing in an airtight container or jar. I know we're still enjoying the last days of summer but making this, I can't help but think of the holidays when we whip up things like this to serve at holiday parties and to pack up as gifts to friends and family. Preheat oven to 300 degrees. Position a rack in the middle of the oven. Line a baking sheet with parchment paper. Mix brown sugar, granulated sugar, and salt together in a small bowl, making sure there are no clumps. In a large bowl, whisk the egg white until very frothy. Add the cashews and toss to coat. Sprinkle the sugar mixture onto the nuts and toss until evenly coated. Spread nuts in a single layer onto the prepared baking sheet. Bake, stirring once or twice during baking, until nuts are golden brown and fragrant, about 30 minutes or so. During the last 5-7 minutes baking, I suggest hiking up the oven temp to 350 degrees (to make sure the cashews toast thoroughly). At this point, watch the nuts carefully, removing them from the oven when they are golden brown and they smell fragrant and sweet; this can take another 10 minutes or so. Remove baking sheet from the oven and let cool on a wire rack until nuts cool completely. Break up any clumps into small clusters. Store cooled nuts in an airtight container for 1-2 weeks. That's how I made almond clusters and now I have to try with cashews too. They are so good! I also thought I'd love these with almonds! Always nice to have an easy and tasty little something you can whip up as a gift. I'm crazy for cashews too! We are so much alike in our love of certain foods Monica :) The packaging is absolutely gorgeous. You could sell these in a bake shop! Great recipe and thanks for sharing! Yes - I love candied walnuts in salads and for sure, these would be welcomed in one! I hadn't even thought of that. Yum…..looks like I have a snack to make this week. I love cashews, too! What a great idea to give away for the holidays - I'm already starting my baking list! I love eating cashews in any form and this one looks so addictively delish. I can seriously finish off that bowl in one go. And love how beautifully you have wrapped them. So good. I hear you. Thank you, Anu. haha oh gosh I love cashews too! I buy sooo many all the time to have on hand. lol These would definitely be perfect for the holiday season ... orrr just to make now (although they would last about 5 seconds around me)! I eat cashews like it's my job and I soooo cannot wait to try this! I buy this kind of nuts (mostly almonds) at the Christmas market or similar markets, but they are always sooooooo expensive. I am so making these, great as a Christmas gift as well. This is wonderful. I love cashews too and buy coated ones sometimes to nibble on. You make it look simple and so tempting. I MUST make these!